The Musculoskeletal Transplant Foundation (MTF) is the nation’s leading tissue bank. MTF designed and validated the use of isolators in the production of DBX Demineralized Bone Matrix (DBX) putty. DBX Putty is the combination of demineralized bone and sodium hyaluronate for use during surgical application. Since the DBX putty is introduced into the body, it must be produced and packaged under aseptic conditions and procedures. Aseptic technique refers to efforts to maintain a sterile field during a procedure to prevent infection. In order to maintain the highest aseptic techniques, it was decided to move the DBX Putty process to isolators for their ease of use in cleaning and decontamination. 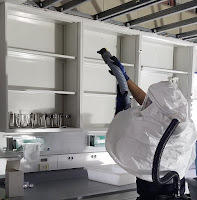 The process whether conducted in a clean room, biological safety cabinet, or an isolator is largely the same with the exception of the decontamination cycle. In order for this process to be economically feasible, the decontamination cycle had to take less than 2 hours. If the decontamination time exceeded 2 hours, then it would not be cost effective enough to warrant the change from clean room processing to isolation processing. The choice was between vapor phase hydrogen peroxide and chlorine dioxide gas. Both methods are registered with the US-EPA as sterilants, and both have been used in clean room environments and in isolators. The VPHP process produced varying amounts of condensation with potential for poor distribution and penetration abilities into gaps and small openings. Based on these limitations, chlorine dioxide, a true gas at room temperatures, was chosen due to its fast cycle times and evidence of its effectiveness. With the reduced cycle times, MTF’s decision to move forward with isolators became feasible. The isolators eliminated the need for using 2.5 ISO 4 clean rooms and provided true aseptic processing. The chlorine dioxide gas generator and isolators worked together to provide a simple and seamless systems integration. To learn more about the Musculoskeletal Transplant Foundation’s selection, design, and validation of isolators for aseptic processing with chlorine dioxide gas, read Nick Barbu and Robert Zwick’s article in Pharmaceutical Engineering here.